The Nano USB Bluetooth dongle is the smallest Bluetooth USB dongle I have ever seen. It is perfect for people who do not have embedded Bluetooth functionality on their laptops and don’t like to those bulky adapters. 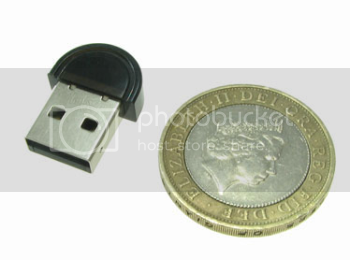 The Nano USB Bluetooth Dongle features a transfer rate of 2.1Mbps and weighs just 39g. In addition to this its way too small in size, its even smaller than a coin! You can connect a Bluetooth device with the dongle within a distance of 33feet. If you liked it then it’s currently available on mobilefun at a discounted price of Â£9.95.